I love fresh juice. I try to make green juices in my beloved Breville a few times each week. When I don't have time to juice at home or am low on produce, I'll pop by I Love Juice Bar for a little pick-me-up. But there are days when I don't even have time to hit up the juice bar, especially since the only location is currently nowhere near my house or work (that's changing soon with the new Juice Bar location opening in Crosstown, but it's still a few weeks away). For those days when a blast of nutrition seems impossible to get, I've got a new product I can turn to — powdered juice! 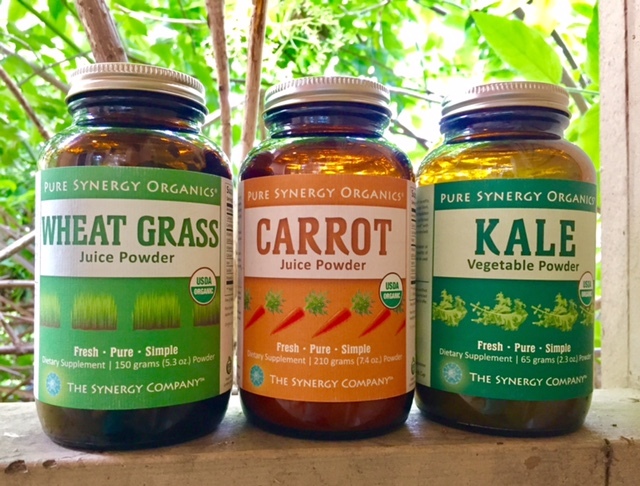 The Synergy Company sent me some samples of their powdered juices to try. 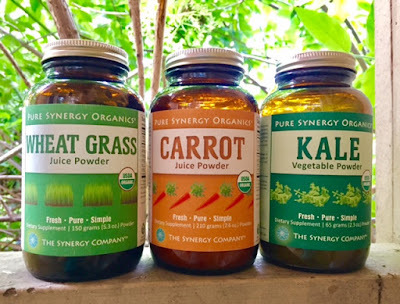 These powders are made from whole foods that are harvested, juiced, and then dried into a fresh powder that you mix with water. Sure, it's not fresh from the juicer, but this stuff is preserved in a way that retains as many nutrients as possible. They use a CO2 low-temperature drying process for some powders and a freeze-drying process for others. All it takes is a teaspoon or so of juice powder and six ounces of water, and — BOOM — you've got juice. Since the juices are in powdered form, these are also great for adding to smoothies. I've often wanted to make smoothies with carrot juice, but I didn't want to go to the trouble of cleaning my juicer AND my blender. Problem solved. Additionally, these are perfect for travel! I like combining the Kale Juice Powder and the Wheatgrass Juice Powder into one very green drink. This tastes much better than if you'd juiced straight kale and wheatgrass. I'm not sure why that is because there are no added ingredients, but it lacks that bitter bite that straight kale juice typically has. Plus, the wheatgrass gives you a great energy boost! The Carrot Juice Powder has a great carrot flavor (slightly sweet and earthy), but I'll admit that fresh carrot juice is a tad bit tastier and creamier. Of course, homemade carrot juice takes a LOT of carrots and can be expensive to make on a regular basis. These run between around $18 a bottle (kale) to $29 (carrot), but there are about 45 to 60 servings per bottle. So each glass of kale juice runs you about 40 cents, and each cup of carrot juice costs 50 cents. That's MUCH cheaper than making fresh juice. 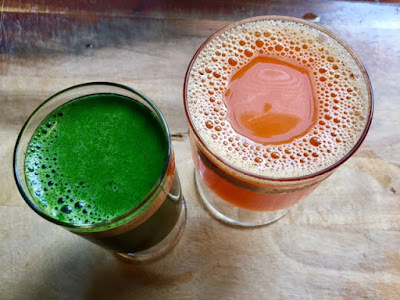 Will juice powders replace my beloved fresh juice? No way! But I love having another option for rushed mornings or travel. Those are nice options to have. I like the idea of adding a little to smoothies too. I don't think I've ever tried wheatgrass juice before now that I think about it. I think I've always been scared because people say it's so gross. But I like green things and I've grown to love green juices so maybe I should try it! It's so funny, as I was reading I was like oh these would be great for travel! And then I thought it would be great to add to smoothies and you mentioned them both! Haha great minds thing alike :) Thanks for always sharing some great products! I wouldn't of expected the kale juice to be cheaper than the carrot! I like the idea of kale powder for when my CSA doesn't have any greens.